By the second half of the 17th century a new, stylised interpretation of the 'Ottoman' border had developed, probably in southern Manisa. Seen here on a double-niche rug, this dramatic pattern is more usually found on single-niche rugs. 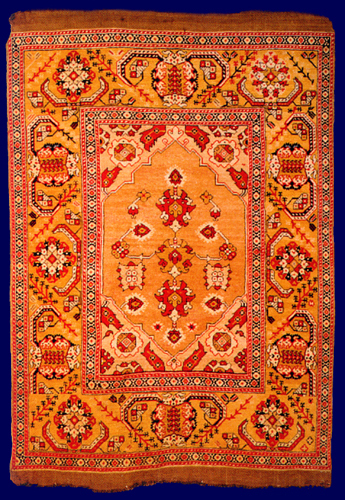 Examples with the minor borders seen here tend to have spandrel designs similar to those on the Sibiu plain niche rug (exhib no. 27). It is most unusual for rugs with this weave and minor borders to have the traditional field and spandrel designs that we associate with central Manisa, but not unique: two rugs in the Black Church in Brasov have similar field and spandrel designs with cartouche borders. This again demonstrates that, while certain field and border designs might traditionally have been used together in one place, the villages in one region might also use patterns normally associated with other regions. In general, rugs sharing similar weave, colours and handle tend to have the same minor border patterns, which suggests that the latter could be a prime indicator of place of origin.